This swarm catcher's purpose is to provide a "Throne" for the Queen to ascend to according to old literature. Back a few years (20+) I attended a lecture at OSU. 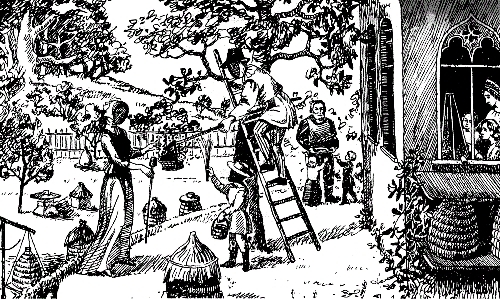 During the lecture (on how Bees prepare to swarm) the gentleman showed an 17/18th century woodcut slide of a man holding a basket on the end of a pole with comb inside to retrieve a swarm. I immediately started using one. " The Queen feels safest between two pieces of Brood comb- that is where she will spend her life. Provide her a Throne and she will call her subjects to her" wrote a Monk in 1775. Over serveral years and many models we have now produced this version and this new method of catching swarms gently, calmly and securely. The queen will migrate to the darker protected areas inside the "Throne"- so far I always have "got" the Queen using the throne on a swarm. Greatly reduces the chance of her taking flight after a shake. 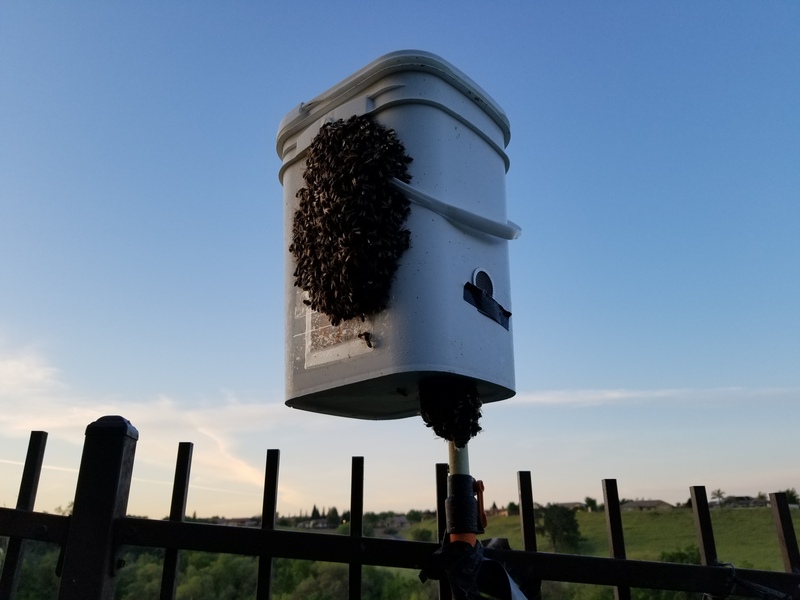 The main feature is that the frames/comb are protected & shaded inside the bucket while still being providing a clear sent "door" allowing smells to be centered (Lid & ports). White has always worked the best for me plus it is easy to see way up there. Being very light it can be raised as tall as you have a pole. Being protected you don't scrape the Queen (or Bees) away as you move it through the limbs and leaves. Being smart it collects all the Bees. Being secure you can close it and put in the backseat. However reading Old English requires some "translation" and I might mention that both these books refer to a King Bee who rules the hive. 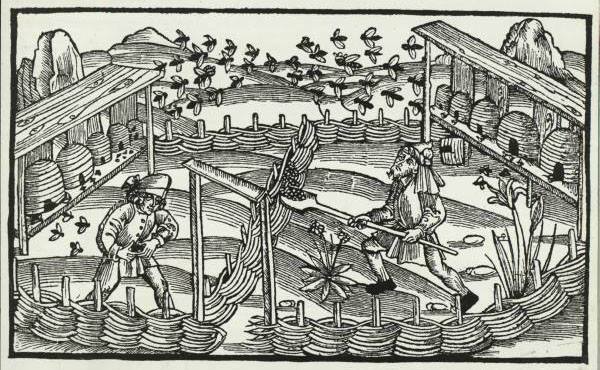 Here is another woodcut showing a "mini-nuc" being used to catch a swarm. This woodcut shows a board with comb attached at the end of a pole being used to collect a swarm that absconded from a fallen skep. BTW the woven fence down the middle is to block the hives view from each other. They believed it reduced robbing by directing the bees upwards.